Sharing the live website projects with clients or colleagues is pretty simple. They just need to visit via the Project Access Link. This will handle the correct permissions no matter what you set for your project. 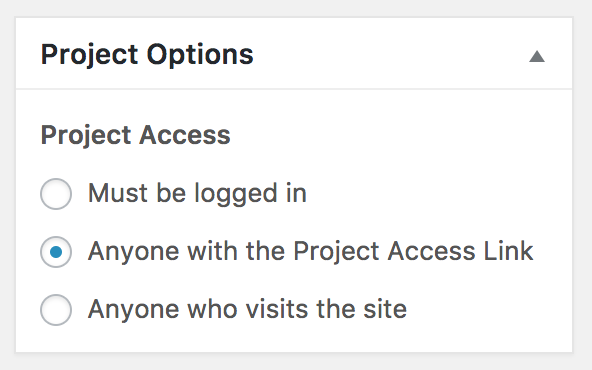 You can set permissions for your website project to control who has access. To do that, locate the Project Options meta box and choose between the options. You can share the website project with your client by sending them the Project Access link. If you need help finding the Project Access Link visit ProjectHuddle > Websites and open the project you want to share. Below the title of the website project you can see the "Project Access Link" that contains a special hash to give the user access to the project. Copy that link to share with the client. Don't publish this link in a public place or anyone can access the website project!